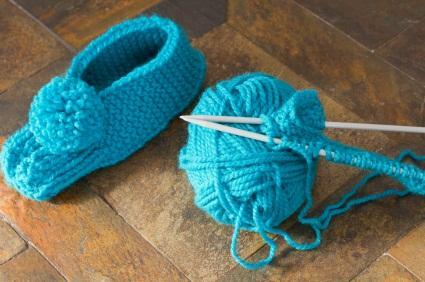 A variety of knit slipper patterns are good to have on hand. With them you can create quick gifts for Christmas, birthdays, or nearly any other occasion. Most knit slippers work up quickly, and if you have even a little experience knitting, you can easily follow basic patterns. Slippers are also called "slipper socks." They can be worn as slippers, especially if you add some fabric painted lines to the bottom of the foot to prevent slipping, but they are also wonderful to wear to bed on a chilly winter night. They are so quick and easy to make that you could make an entire wardrobe of them with the scraps from your other projects. You only need about three ounces of 4-ply yarn total and can easily use up an ounce or two of several colors. For many people, slipper socks are the second project that they do after learning to knit. Scarves are usually the first thing people knit. Once you learn how to knit a scarf, then slipper socks are an easy transition to hats, mittens, and sweaters. You will be knitting with two strands of yarn held together. This gives the slippers extra warmth and padding. You can use two different colors if you wish. Hold two strands of yarn together and cast on 29 stitches. Row one: Knit 9, purl q, knit 9, purl 1, knit 9. Repeat the pattern until the foot measures about eight inches. Row one: *Knit 1, purl 1. Repeat from *. Row two: *Purl 1, knit 1. Repeat from *. This forms ribbing. Repeat the two rows until the ribbing measures 4 inches. Next row: Decrease one stitch. 28 stitches remain. Next row: Decrease for toe. *Knit 2 together, repeat from *. You now have 14 stitches. Cut the yarn, leaving a 12-inch tail to sew the toe seam. Put end of yarn through a darning needle and pull the yarn through all of the stitches. Pull tightly to close the toe of the slipper. Sew the toe seam until you get to the garter stitch portion of the slipper. Knot and weave in ends. Slippers should be hand washed in a gentle soap and rinsed well. You will want to lay them flat to dry, and you may need to reshape them once in a while. Store them away from direct sunlight that can damage the fibers. Knitting slippers is a relaxing way to spend a chilly autumn evening while watching television or watching the rain fall outside your window. Once you have made a pair or two, you will be able to create slippers without much thought, using up scraps of yarn in the process. Like other handmade gifts, knit slippers are a welcome addition to Christmas stockings and gift bags. They are nice to have on hand for overnight guests, and they sell well at church bazaars and other fund raising activities.